The idyllic picture of dogs playing together at the park is something every pup parent wants. You can see the joy on your dog’s face as he makes new friends and stimulates his body and mind. That vision is shattered, however, at the first sign of rough play. Your dog growls, bites, tackles, and chases in a way other dogs don’t appreciate. Instead of making new friends, your dog tries to dominate his playmates. If his rough play hasn’t led to a fight yet, it probably will soon. You don’t want to deprive him from having fun at the park, so it’s time to teach your dog how to play nice. Is Your Dog Really Playing Too Rough? Dogs have a way of communicating with each other that tells playmates when they’re having fun and when they’re serious. Humans don’t always pick up on these subtle cues, and what looks like a fight to the death could be two playmates having a mutually good time. The issue comes in, however, when that balance is shifted. As soon as one dog stops having fun, there’s a risk of the situation getting out of control. All dogs are different, and all dogs have different play styles. You’ll even find dogs at the park that enjoy being tackled to the ground. They think it’s great fun and don’t mind the roughhousing. But if your pup is playing in a way that makes another dog scared or nervous, there’s potential for conflict. Here are a few ways to tell your dog is taking playtime too seriously. If you observe any of these behaviors during your dog’s playtime, there’s a chance the situation could escalate into dangerous territory. What’s Causing Your Dog’s Rough Play? When a dog consistently plays too rough, it could be for a number of reasons. 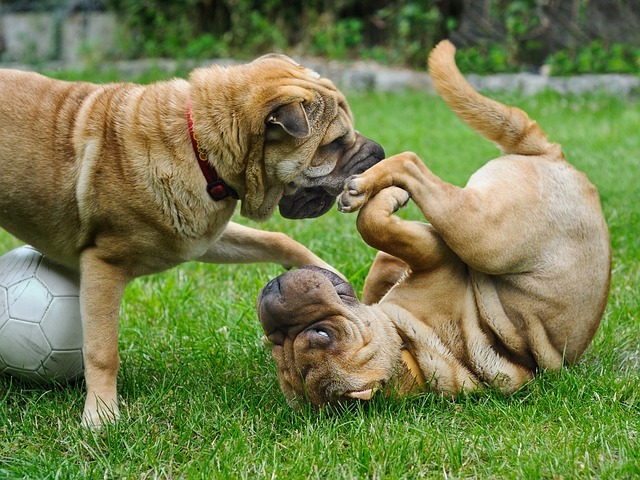 First, many young dogs turn to roughhousing because they can’t quite control their emotions. They get so excited and overstimulated by what’s going on that they can’t help but get out of control. In some cases, your young pup will grow out of this phase as he learns better impulse control. Another reason why young dogs play rough is because they were accidentally taught to do it that way. Older dogs sometimes play rough with puppies to show them who’s boss, and the puppies do what they need to do to keep up. People are also to blame for this misguided life lesson. Have you ever wrestled with your dog on the living room carpet? Play wrestling is fun, but it teaches your pup to take that style of play into the unpredictable environment at the park. There’s also the possibility your dog plays rough because he’s trying to dominate another dog. In this case, he’s not actually playing. It’s a kind of minor aggression that won’t lead to anything good. 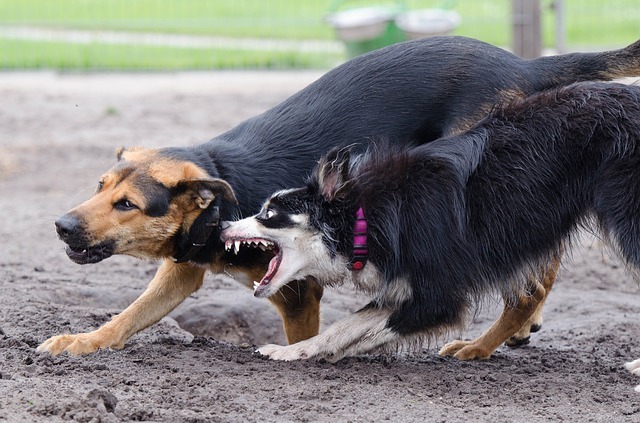 You’ll need to decipher why your dog feels the need to dominate other dogs and address that specific issue before you can expect him to start playing nice. The best way to ensure a dog learns how to play appropriately is to socialize him from a young age. 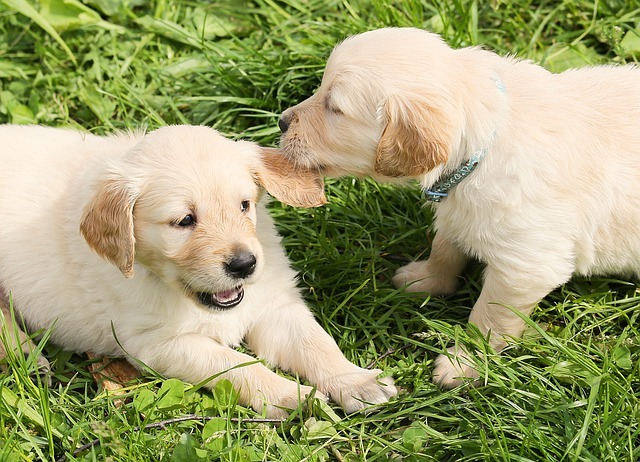 Puppies teach each other what works in play and what doesn’t. When something hurts, they yelp. When a playmate does something they don’t like, they let them know. This kind of trial and error is essential for dogs to figure out how to interact with others. If your pup is already past this point, don’t worry. There are still ways to teach adult dogs how to play nicely with others. Having a foundation of obedience will be the difference between chasing your dog through the park and using your voice to call him to you. You won’t directly address his issue with playing at first, but obedience is an invaluable part of the process. Before you let your dog loose to play with others, you need to be confident in his training. Will he remember his recall when he’s distracted by other dogs? Will he still listen to you when all he wants to do is tackle every dog in sight? If the answer is no, it’s time to take a break from the park while you focus on reinforcing obedience. You’ll have an easier time guiding him toward more appropriate play when you can easily communicate. When you’re at the park and Buster or Fido or Fluffy is playing with another dog, it’s your job to closely observe what’s happening. You need to stop rough play before it actually happens. To do this, you should be an expert in your pup’s body language. When you see signs he’s getting overly excited or aggressive, that’s your cue to step in and calm him down. Sometimes those signs include stiff body movements, low growling, or a fixated intensity. If that doesn’t work, you can also look at what your dog isn’t doing. Play bows are a good sign everyone’s having fun, and dogs that are playing well together usually bounce around with their tongues flying out of their mouths. Every dog plays differently, however, so you’ll need to learn what’s “normal” for your dog and stop their playing as soon as things get too intense. The goal is for him to learn getting overly excited results in a timeout. By letting your dog continue to play rough, you make him think it’s okay. Stopping things before they get out of control is important, but you’ll also need to be careful about what kinds of situations your dog is exposed to. If you know he gets extra excited in big groups, stop taking him to the park at peak times. If you know there’s a specific dog, or a type of dog, that usually brings out his rough play, make an effort to avoid those dogs (at least until you’re further along in the training). You don’t want to set your dog up for a situation you know he’s not ready to handle appropriately. Besides sit, stay, and come, one of the best cues you can teach your dog is to settle. When he’s barking up a storm at the neighbor’s cat, bouncing in anticipation of dinner, or ready to show another dog who’s boss at the park, hearing the word “settle” will tell him it’s time to calm down. Dog behaviorist Victoria Stilwell suggests starting to teach this cue in a no-distraction zone. Say the word “settle” and use a treat to lure your dog where you want him to be. This can be on their mat or in a sit or down position. Once he’s consistently following your lure, make him wait calmly for a few seconds before dishing out the reward. If he’s anything less than perfectly calm, start over. With practice, you can add distractions to this routine. Try taking him into the yard, and then the sidewalk, and finally an area where he can see other dogs. Make these changes gradually and only when he’s consistently listening to you at the previous stage. With time, your goal is to be able to get your dog’s attention no matter what’s going on around him and have him calm down on cue. For more information, read this article. No matter how much you want that picture-perfect experience at the dog park, you can’t rush the process of teaching your dog to play nice. Some dogs will reluctantly put up with your pup’s rough behavior, but there are also dogs that will feel threatened and fight back. Don’t put yourself in a situation you can’t control, and don’t expect your pup to be perfect on the first day. If you’re having trouble solving the problem on your own, don’t give up. A professional dog trainer will be worth the cost.